A thermistor, whose resistance value varies according to the engine coolant temperature, is built into the engine coolant temperature sensor. 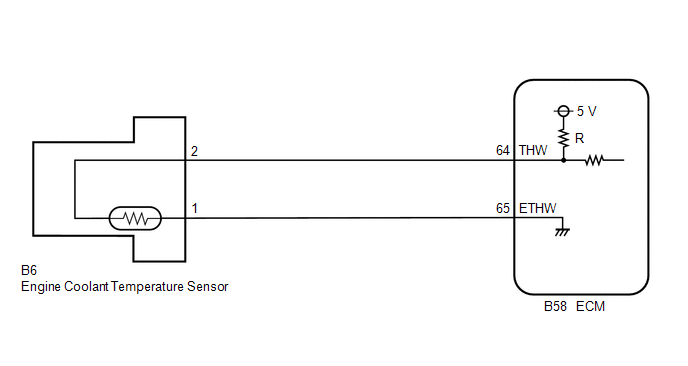 The structure of the sensor and its connection to the ECM are similar to those of the intake air temperature sensor. When any of DTCs P0115, P0117 or P0118 are set, the ECM enters fail-safe mode. During fail-safe mode, the engine coolant temperature is estimated to be 80°C (176°F) by the ECM. Fail-safe mode continues until a pass condition is detected. When any of these DTCs are set, check the engine coolant temperature by entering the following menus on the Techstream: Powertrain / Engine / Data List / Coolant Temp. The engine coolant temperature sensor is used to monitor the engine coolant temperature. The engine coolant temperature sensor has a thermistor with a resistance that varies according to the temperature of the engine coolant. When the coolant temperature is low, the resistance in the thermistor increases. When the temperature is high, the resistance drops. These variations in resistance are reflected in the output voltage from the sensor. The ECM monitors the sensor voltage and uses this value to calculate the engine coolant temperature. When the sensor output voltage deviates from the normal operating range, the ECM interprets this as a malfunction in the engine coolant temperature sensor and sets a DTC. If the sensor output voltage is more than 4.91 V for 0.5 seconds or more, the ECM determines that there is an open in the engine coolant temperature sensor circuit, and sets DTC P0118. 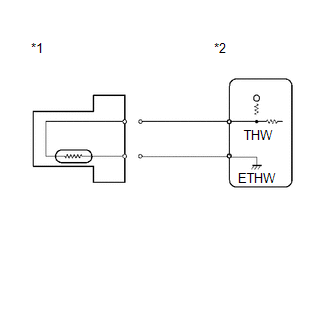 Conversely, if the voltage output is less than 0.14 V for 0.5 seconds or more, the ECM determines that there is a short in the sensor circuit, and sets DTC P0117. Wait 0.5 seconds or more. Input the DTC: P0115, P0117 or P0118. If DTC P0117 is stored, check that the engine does not overheat (the DTC P0117 may be stored due to engine overheating). (d) Enter the following menus: Powertrain / Engine / Data List / Coolant Temp. (e) Read the value displayed on the Techstream. Between 75 and 100°C (167 and 212°F) with warm engine. If there is an open circuit, the Techstream indicates -40°C (-40°F). If there is a short circuit, the Techstream indicates higher than 135°C (275°F). (a) Confirm good connection at the engine coolant temperature sensor connector. (b) Disconnect the engine coolant temperature sensor connector. (c) Connect terminals 1 and 2 of the engine coolant temperature sensor connector on the wire harness side. (f) Turn the Techstream on. (g) Enter the following menus: Powertrain / Engine / Data List / Coolant Temp. (h) Read the value displayed on the Techstream. Perform "Inspection After Repair" after replacing the engine coolant temperature sensor (See page ). (e) Enter the following menus: Powertrain / Engine / Data List / Coolant Temp. (f) Read the value displayed on the Techstream.